We have always suspected the Treasury modelling of the impact of the carbon price was a crock, and now we have been proved substantially right, with the Treasuring admitting as much. Not only that, but a “finding” that carbon pricing would not increase unemployment was actually an “assumption” in its modelling. Astonishing! 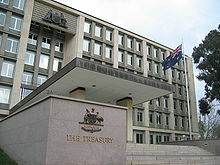 THE Treasury has admitted that in modelling the cost of the government’s price on carbon it assumed countries would trade emissions after 2016 despite the fact there is no indication major emitters such the US and China will do so. A senior Treasury official previously told a Senate select committee she did not assume countries would engage in emissions trading. But critics such as economist Henry Ergas pointed out that Treasury had claimed in its modelling there would be a global price for carbon by 2016 and said the only way this could happen was if major countries were trading emissions. The Treasury has now written to Professor Ergas conceding that the modelling undertaken in the Strong Growth Low Pollution report assumes “countries allow individual firms or governments to trade abatement with firms/governments in other countries through some mechanism”. It says “some such mechanisms are currently in place under the UNFCCC framework”. All schemes under the UN Framework Convention on Climate Change involve emissions trading or claiming a credit for emissions reductions. Henry Ergas responds in detail in an opinion piece entitled Lies, Deception and the Carbon tax. Read it all. « Who will Julia alienate next? How spiteful can labor be.Not only do they introduce legislation that a significant portion of the population don’t want.But then make it so watertight that any new government can not repeal it. I hope labor fail that badly at the next election that they are vying with the greens for relevance. Don’t know why you would use language like Treasury Modelling, especially when it is in fact it nothing but Plunderers Arithmetic; At law it would be called criminal conspiracy to defraud , Not Treasury MODELIN . Criminals model a conspiracy on what they can plunder and where the most can be plundered from. Despite Professor Warwick McKibbin being one of the world’s leading authorities on modelling emissions reductions, the Labor/Green government did not use his model in its assessment of the carbon ‘dioxide’ tax because his model tended to show the cost of emissions trading to the economy would be higher than the other models used. He said (here) one of his concerns about the report the government had released was that it didn’t seem to take into account the great degree of uncertainty about the economic outlook. “We are in a very uncertain situation internationally and Treasury should test various scenarios,” Professor McKibbin said. One scenario that Treasury has not modelled is the one that prevails in which Australia reduces its emissions in the absence of a legally binding international commitment to reduce emissions. But have no fear, the Government has calculated Weet-Bix cereal to rise by 0.00024 cents a biscuit, Tim Tams will increase 0.012c and 0.004c on a box of tissues. Yeah right!! On assumptions I think it is safe to say that we should ‘assume’ anything that has Labor/Greens finigers in it at the moment is dodgey or perhaps the more correct word would be sceptical? Gillard is obviously prepared to go that extra mile to ensure that she is remembered as THE WORST PRIME MINISTER OF AUSTRALIA EVER. I assume our #1 World leading Teasurer helped model this assumption? I wonder who we assume will be the first sacked under the new Rudd Brown Green Gumment, assumeably could be #1? The treasury fails to accurately forecast anything. Ever since Henry took over it’s projections have been hopelessly wrong. Now it is advising a terribly incompetent government in an incompetent manner on a subject that is far from proven but likely to be falsified and the policy so derived will send our economy to the wall. Who can we sue?